Further photos for the pleasure of everyone. Caught and postured moments, street-shots, art photos, serial shots, close-ups, with and without scissors. Take a look at Browser 2, 3 and 4, as well. Note: the Hungarian laws allow to publish photos taken at a public place without informing the involved person. 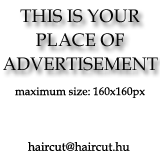 Still, if you happen to recognise yourself, and you are against your photo being published on the homepage, please send us an e-mail to the following address: haircut@haircut.hu, and the photo will immediately be removed.